This piece appears in another form along with a photo essay on Yahoo News on the 22nd of July, 2013. * Abiku: The word is derived from Yoruba: (abiku) “predestined to death”, which is from (abi) “that which possesses” and (iku) “death”. Abiku refers to the spirits of children who die before reaching puberty; a child who dies before twelve years of age being called an Abiku, and the spirit, or spirits, who caused the death being also called Abiku. ‘Dekho meri beti kaise soh rahi hai,’ Said Muragama, a visually impaired single mother of two, whose second child now lay covered in ceremonial shrouds, as she and her eldest daughter, prepare to bury her at Dodamma Burial Grounds near DJ Halli in Bangalore on the 17th of July, 2013, just as news and the political-mudslinging of the mid-day meal tragedy, 23 deaths and counting at Bihar’s Chhappra district begin to enter into mainstream and international news. The tragedy of the everyday, simplest lives of others, the tiniest statistics, the numbers of the diminishing laughter of children, seem to belong on the same planet as the UNICEF report that claimed one in three of the malnourished children of the world, live and die in India. 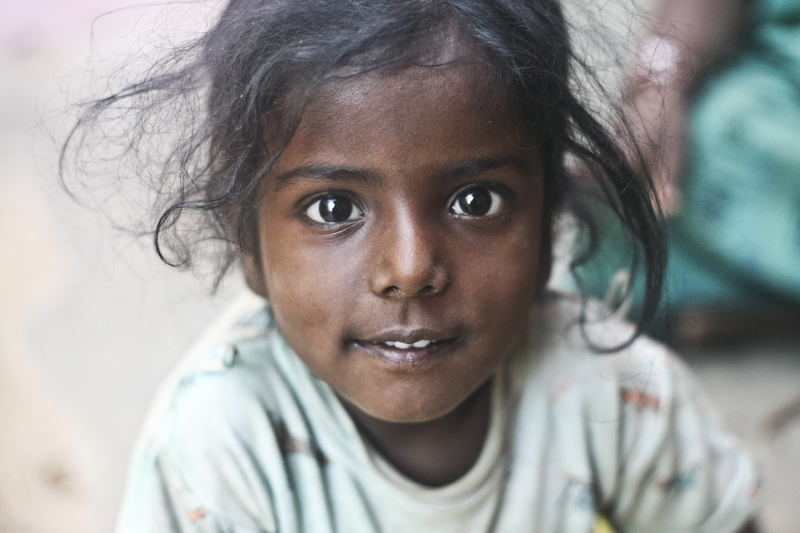 Meghala was born on the 17th of November, 2006, to a Christian Dalit mother, who lived at Bangalore’s DJ Halli, in a small decrepit corner of the slum next to a garbage heap, which leaked and seeped miasma into their lives. It would be the same world, where her mother would mostly spend time sitting on her neighbour’s porch, often abused and sent away, literally left to her own means. A family of hijras, would at times help feed Meghala, her sister and her mother, within their own limited means, but it would be Meghala’s older sister Ruth, who would spend her day at a factory making incense sticks, that earned her Rs.15 a day but she would leave her job once it started to afflict her hands. Her sister used to return home with callused and sooted palms and help to cook, clean, collect water, and help her mother move around. Her sister is just thirteen years old. She would spend her entire life in DJ Halli, a place with more temples, churches and mosques than anganwadis, and at her home at Modi-Road itself, her own anganwadi of Indirapura, one can clearly see the temple encroaching over the anganwadi building, or the anganwaadi encroaching into the temple. It has neither a toilet, or a storage space, or like her home, no supply of drinking water. Her mother Murugama, who lived without a BPL card, who deserved both a widow’s pension and a disability pension, didn’t receive it till date, and lived in a cynicism, of unemployment, of listlessness, of a history of pain, from losing her eyesight to a life without a husband, to her helplessness of not being able to bring up her two girls. Murugama lost her eyesight when she herself was just nine years old, to an inexplicable fever, and was brought up by her own mother Pushpama, who worked and toiled as a construction labourer, who passed on in July 2008, leaving her alone to look after her two girls. Yet there was a sense of strange pride in her, ‘I have to beg, what can I do?’ she would say, taking her children to the Church or the nearby Durga for food, an unsteady supply of nutrition, like the anganwadi that could only deliver ration to her home once in a while, and would relegate responsibility to Meghala, as she just turned six, an age above the mandate of the ICDS programme. Disability, blindness, did not fit into the scheme of things of the community-based program, and the first government official from the Women and Child Welfare Department to visit Murugama, would mention, ‘we need community support as well.’ And Meghala was suffering from malnutrition, which was evident in the fact that she couldn’t use her legs, or that she looked a mere 2 year old when she was turning six, and her recent weight was a mere 11 kilograms, which is far from the standard weight of a six year old, 16 kilograms. It was finally after Sunday Mass, when Meghala’s mother began to notice that she was developing a fever and would be diagnosed with pneumonia. And they would take her to BR Ambedkar Medical Hospital at Tannery Road, who refused to admit her. She was only admitted in Baptist Hospital across town, after a social worker threatened to expose them with legal threats and media coverage. But within two days, Meghala would lose the use of a third of her lungs, now filled with mucus and blood, would be vomiting and coughing blood, and would be left on a ventilator. Meghala, would finally leave this realm of hunger, at 4:31pm, and would be taken to Dodamma Burial Grounds, and watch a Christian Dalit ceremony, while her older sister, would quietly say goodbye to the one who was more than a sister, but also a daughter. A short ceremony in Tamil, interspersed with silence, songs, and the quiet tears of broken people, ended with a pastor asking the visually-impaired Murugama, if she would like to see her daughter one last time. She would touch her, and move back, and as the sounds of shovels covering her small coffin with the earth filled the quiet landscape lit by an ambulance’s headlights that began to retreat, Murugama and Ruth leave the cemetery and simply sit down on the side of the road, watching members of the Church and others leave. Her neighbours were visibly absent. Poverty is loneliness. The last Global Hunger Index (GHI) by the International Food Policy Research Institute, had rated 120 countries and India has ranked 65th with the level of hunger being the same as it was in 1996. Malnutrition in India remains the constant, the saint of deprivation, the anti-posterboys and girls of a growing economy’s mythical rise, the moonfaces of an invisible shame of a middle class. 2689 died between 2009-2011 in Raichur, Karnataka. The death toll at Attapadi in Tamil Nadu, has now reached 54, as per the 18th of July, 2013. Dates. Numbers. Statistics. Dates. Histories. Public Policies. Hunger. Hunger. Hunger. They tend to remain the same. In Maharashtra, the issue was raised in December 2011 in the state assembly where it was revealed that 65 infants die daily in the Maharashtra, with 13,683 deaths having occurred between January to September 2011 alone. Yet the State Woman and Child Development Minister claimed that these were not related to malnutrition. As for pneumonia, more dreaded statistics from the grim reaper statisticians of the UNICEF again, state that 3.97 lakh children under the age of five died of pneumonia in 2010. Meghala, turned this year six. While the age of St.Complacency of the government, seems to grow older, staking its claim to divinity and immortality. The Woman And Child Welfare Department says it has no responsibility about pneumonia, which comes under the watch of the Health Department. The wreckage of a house that housed this family, the heaps of garbage, the seepage of miasmic rainwater, doesn’t come under either department, as infrastructure comes under the gambit of the Bruhat Bangalore Municipal Corporation. And it was Ruth, who took pride in looking after her. One wonders how the Food Security Bill will answer the her question. In Karnataka itself, it was the 22nd of May, 2011 when a Kannada news channel had put out the news of starving and dying in Raichur, the only place where there is a a gold mine in India, arsenic in the groundwater around it, and the Thermal Power plant that supplies electricity to half the state. A letter concerning the matter written by Vimochana Sangha led to a Public Interest Litigation and the creation of a Core Committee. What is clearly stated in the Core Committee’s reports in Karnataka is that every government body, from the Panchayat Raj, to the ICDS, to the Municipal Corporations, to the Horticulture Department, to the Women and Child Development department has a roll to play, yet to everyone’s dismay they often just blame each other when swollen bellies start showing up on television screens. If there is no space for Angaanwadis in Bangalore, the Karnataka Slum Development Board, has to help to ensure there is. If the supply of food to Angaanwadi centres is broken, the supervisors have to ensure that Angaanwadi workers don’t have to buy eggs and milk out of their own pay. ASHA workers must work with pregnant mothers to ensure the mother’s themselves don’t suffer from anaema and give birth to the most fragile littlest of a human beings. Once severely malnutritioned children are sent to NHCs, the government has to ensure that there is a provision for the mother or guardian to stay with the child, and is provided minimum wage under the MNREGA, as the mother or guardian would be losing work-time during her/his stay in the hospital. The Department of Rural Development and Panchayat Raj should conduct Gram Sabhas for the purpose of empowering communities in dealing with malnutrition. The Department of Horticulture, Government of Karnataka should plant fruit bearing saplings i.e., guava, chikku (sapota), papaya, pomegranate and local seasonal fruit bearing saplings i.e., nerale (blackbeny) anjur (fig), sitaphal (custard apple) etc., in the backyard of the Anganawadi Centres. Yet these are only a few recommendations from an 89-page report that covered every crumb and corner of the state’s embrace of malnutrition and its salvation. The case, a symbol of anything that can claim human decency, has as many lessons as the 12 year long Right To Food case. Meanwhile the Food Security Bill has no grievance redress system, no provisions like old age pensions for the support of senior citizens, the homeless, destitute, and only provides for cereals and not basic food necessities, it provides upto 5kgs per person per month, thus ensuring only 166 gms of cereal per person per day, which is barely enough for two rotis a day, according to the Right To Food Campaign. Yet in Murugama’s case, it clearly fails as the new Food Security Bill, again opts for a targeted Public Distribution System. Murugama, had no BPL card, how is the state going to find her? It already lost Meghala, and the government is promising her a BPL card after news reports of her death even got the Chief Minister to deem the matter serious. Apparently, it takes a death of a child to get the government to consider you poor enough to get a BPL card. 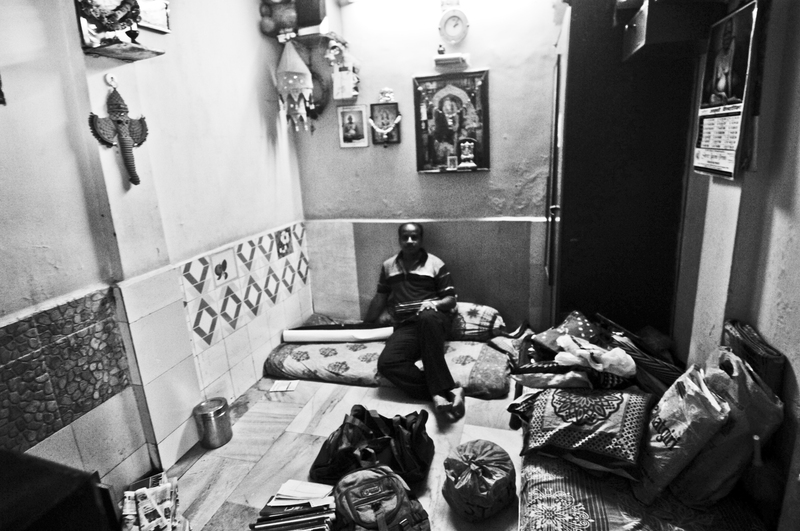 During the fifth demolition drive at Ganesh Krupa Society on February of 2012, Rajendra Mistry, a supervisor in a maintenance firm, pulled me away from documenting the demolishing of another house and asked me to follow him to his own house. I asked him why and he says he wants a photo of himself in his house before the ‘haramis’ (bastards) break it down. He sat down on his mattress, before his packed belongings, his idols and gods still hanging from the walls, with the solemnity of silence itself. I took the photos for him, and by the end of the day, it didn’t matter as much. By five in the evening, the demolition crews left. His house survived. On the 3rd of April this year, after the sixth demolition drive, it’s a field of rubble. This would take place after a demolition drive at Golibar’s Ambewadi on the eve of Woman’s Day when women were dragged off and allegedly molested by the police and unidentified persons, and nine homes were demolished. And this time the state accomplished in demolishing 43 homes at Ganesh Krupa Society, most of whom, in an act of resistance, were rebuilt by the residents after the last demolition drives. To the people of Ganesh Krupa Society, who’re predominately working class, even if they break down their homes, that is more than just a property, more than just shelter, they will put in money to rebuild, some having spent anywhere between Rs.10,000 to Rs. 40,000, as an act beyond protest, beyond the frustration of protest, beyond dharna after dharna, march after march, court case after court case. Yet this last demolition drive has been particularly brutal, ripping out foundations, leaving no trace of a home, just leaving landscapes of an exploding city. Meanwhile, Ambewadi society, across the road, has been on a sit-in, and a relay hunger strike since the 20th of January, 2012, after a private security firm hired by the builder ended up in a violent clash that led to the hospitalization of two women from Ambewadi, where the police refused to lodge a complaint against the builder, and instead charged the residents. Ambevadi is where stenguns are carried by the police and taken to the settlement for a welfare scheme. Ambevadi, is where the ironies of dalit capitalism are clearer than ever, where the Budh Vihar, is where the residents swear on Babasaheb Ambedkar, and the nostalgia of the Dalit Panthers, and plan their strategies against the builder, himself from the Schedule Caste. Ambevadi society and Ganesh Krupa Society, are the frontlines in this war of attrition of profit, two of 46 societies the builder has to acquire for his township, the thorns in his plans. He so far, only has eleven. Most have still taken him to court. Most still join the rallies against him, as they did during the ten day protest at Azad Maidan in January of this year, that had led the Maharashtra State Government to agree to conduct inquiries, through the Principal Secretary of Housing into six Slum Rehabilitation Projects including Golibar. It had put a moratorium on demolitions until the end of the investigations, except those where the High Court has precedence. But to both Ambevadi and Ganesh Krupa Society, thanks to questionable court orders, they faced demolition drives. And that brings us back to the judiciary, and the redundance of it all: the order that was once passed in the matter concerning Golibar’s Ganesh Krupa Society, where the Civil High Court, ruled in favour of the builder, stating, ‘‘that no useful purpose will be served by allowing the petitioners to raise any dispute about the meeting which was held on 7th February 2009.’ A criminal case filed by the residents against the builder and the chief promoters of the project in Ganesh Krupa Society, led the court to order the police to investigate and chargesheet those accused of forgery and fraud, as the residents claim, there was never any mandatory 70% consent in the project, and the ‘disputed meeting’ never took place. Yet the police have only stalled their own investigations, and instead come for demolition drives. The project and the builder has even been indicted by the Comptroller Auditor General report released in 2012, that the builder had grabbed public lands, and there was never any transparency in the manner in which the Slum Rehabilitation Authority or the builder acquired consent from the residents. Yet the Chief Minister Prithviraj Chauhan remains a mute spectator. And on the 30th of March, a few days before the coming demolition drive, resident, leader of people on Ganesh Krupa Society, tailor, mother, angaanwadi teacher, Prerna Gaekwad, asked the Deputy Police Commissioner why he was sending a police force to support ‘criminal’ activities, when the inquiry is yet to be finished, and his response was that he is helpless against a court order. Prerna was detained on the 7th of March, when she went across the road to help prevent the demolition drive at Ambevadi. There too, they were just following orders. Thus the Judiciary is the hammer, the judiciary is the bulldozer, a judge might as well be driving it. The anger against the courts, against the law, against a biased system, is palpable at Golibar. It is the High Court orders that take the bulldozers into their living rooms, it is the High Court orders that annihilate any idea of equitable justice, and becomes the reason itself for injustice, the enemy of the people. It is an unstoppable movable force, a betrayal, the judiciary that is meant to protect the constitutional rights of people, is a market ally, a creation of the stillness of rage: a stillness of rage that is not impotence, it reaps a whirlwind, it destroys any idea of respect for the law, and then lawlessness will be justified, the anger will be rebellion, it will become the fist that fantasizes to smash the collector’s face, it will be the riot, the arson, it will become the irrationality of the stone thrown onto the moving local, it becomes to rage against those in the towers who sit quietly, it becomes the end of a citizen, the anomie, the culture that keeps reacting to violence with more violence, an informal violence, for those who destroyed their lives, the so-called police-builder-politician-nexus, are too far beyond for their reach. And even if the market and the prophets of the free market of the world may eventually win, whatever scraps of the earth that is left to them, for a brief moment in the history of time, of a million years of this earth whose stones told the lonely geologists the poetry of a world without men, there are the bricks of demolished homes of people who lived in the slums of civilization, who will speak about self-respect. Interviews with builder after builder, the question of respect for the residents is a joke, their only response is silence. Instead, during the demolition drive, a builder wanted to watch each and every brick breaking from the house of Sudesh Paware, a railway employee and one of the residents who protested with resolve against the builder. ‘With a lot of pride, he watched them level his house to dust,’ said Shekhar Mirgule. Yes, many residents don’t protest against the state, against the builder. The homes of those who supported the builder in the beginning itself, or those too wary to fight the Juggernaut of development were the first to go. Then there are those who’re bought off. Yet there are those who refuse: there are those who hold onto their self-worth: their rights, their protest. Even after 43 homes have been broken down, not a single resident has taken the builder’s offer. And for a brief moment, it wasn’t the market, it wasn’t greed is good, it wasn’t aspirations of the working class to claim the towers of the rich without baying for their blood, it was simply a humility and a truth: that we want respect. The market respects respect as the machineguns the police bring into the settlements they want to destroy in the name of a welfare scheme. A welfare scheme that is nothing but the annihilation of community. Give us your riches, and we shall leave our home, maybe. We will betray our brothers, our neighbours. You spend more money trying to destroy our resistance, than you do in just giving it to us. The market is the ego of the rich, the market will not allow the working class to claim equality in profit. The market is the bulldozer of the stillness of nostalgia, it is the rubble of rage, and from that rubble, your streets will be filled with madness. You are currently browsing the archives for the Social Apartheid category.